At Instant Imprints Vancouver, our customers come to us when they want to be more visible to their customers. We create that visibility five different ways: Branded Apparel (embroidery), Signs & Banners, Promotional Products, Custom T-Shirts and Print Services. 7 of us in the office needed to get our company logo embroidered on some jackets. After searching online, I ended up calling Bryan at Instant Imprints and he and Ashley were able to get the job done quickly, on time, at a great price and at a high quality. I would highly recommend giving them a call. If your business is in the market for custom t-shirts, banners, printing services, embroidered apparel or other promotional products, your local Instant Imprints® has what it takes to deliver you exceptional marketing materials, right here in Vancouver Westside. You can drive brand visibility in a smart and stylish way by utilizing our superior promotional material service. When you work with us, you have the confidence of knowing that your job will be done right the first time and delivered when you need it. You’ll also be getting a level of quality which would otherwise be impossible through home and office printing attempts. When you step into Instant Imprints, our Image Experts can ensure that your project is the best that it can be and answer any questions you may have. Best of all, your project is produced in-house from start to finish, right here on West Broadway Street. Get a world-class service with a local Vancouver touch, only at Instant Imprints! Custom t-shirts are one of the most tried-and-true forms of promotion that are out there, and for good reason. They bring your brand message wherever they’re worn, and give your logo a chance to travel the world. You can utilize custom tees to promote an upcoming event, push a new product or give your overall brand a boost. Use them at giveaways to entice new prospects, or put them up for sale to let your most loyal customers show their support. Our Personalized T-Shirt Service uses state-of-the-art production techniques to give you an unsurpassed level of quality, and our Image Experts bring you a personal touch that makes your project unique. They strive to understand your promotional goals and help your project be the best it can be. Whether your custom t-shirts stay local or travel the globe, they’ll be promoting your brand wherever they’re worn. Custom signs and banners are a great way to bring your logo to the streets. Whether you want to decorate the sidewalks or the sides of a skyscraper, a custom sign or banner is the way to go. You can choose from a plethora of materials and design options to make a banner that fits your unique needs. Banners are durable and reusable, inside and out. 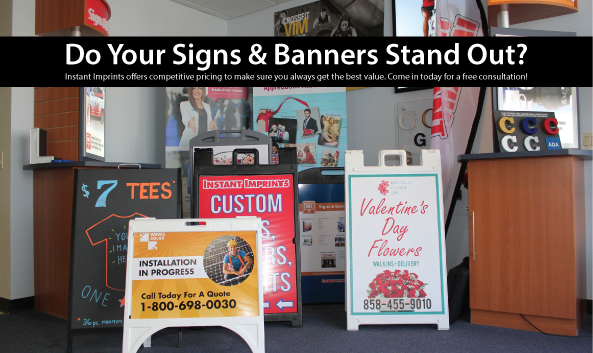 You can invite customers into your store with a sidewalk sign, or use a banner to promote your next event. Get creative, stand out and make an impact on the public with the best custom signs and banner service in Vancouver! At Instant Imprints in Vancouver, we abide by a set of core values that help ensure you have a positive promotional experience when working with us. We value quality and timeliness, making sure to get your job done right the first time and delivered by the deadline, or early. By working with a pro print shop like ours, you can avoid the costly revisions that plague home and in-office printing efforts. Our top-of-the-line production methods combined with the personal touch of a local Vancouver Image Expert means that you will have your business represented in a way that helps your brand reach its full potential. Finding a great print shop near you can be hard. When you stop by your local Instant Imprints Center in Vancouver, you’ll be taking a big step toward a better brand. By utilizing the power of professional promotional materials, your business can enjoy an increased brand awareness and a closer connection with customers. Our team of Image Experts is happy to help your project be successful every step of the way. Whatever your goals are for your business, Instant Imprints can help you make them happen by providing you with the highest quality promotional goods around. You’ll be sure to turn heads and drive traffic your way with the power of our branded products. Stop by our Vancouver Westside showroom to see some samples of our superior promotional products in action, give us a call at (604) 558-0767 or request a quote online to get started today.